How can I get a warning if someone try to hack my Gmail account? Is there a hidden feature in Gmail, that let you know each time someone has tried to login to your account with a wrong password? LogMeIn has this feature. Is there something like that in Google Gmail? It should work very simple: you getting mail for each failure login, with the IP of the computer that tried to login and failed. Google does not have this feature currently. Gmail does log successful access to your account though, so you would see if anybody managed to actually break in. 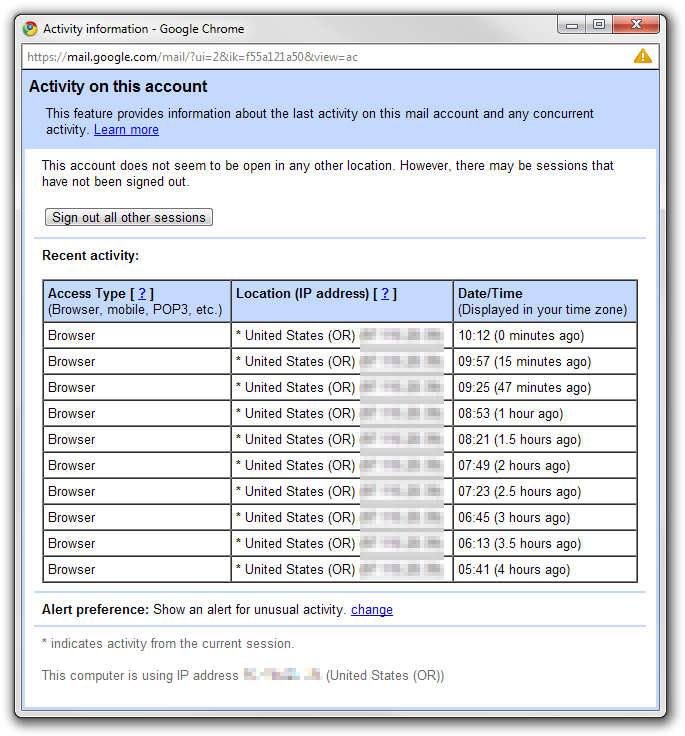 At the bottom of your gmail page it says "Last account activity: [x] minutes ago from [ip]". If you click the details link, it will show you a list of the most recent access, the location, and the IP address. Make sure you have the Alert preference set to "Show an alert for unusual activity" so that it will alert you to suspicious activity, such as logins from different geographical regions and similar suspicious behavior. Google has done this for some time, now. If it detects "unusual" activity in regards to a login on your account, it will contact you at your email address. It will also contact you at your secondary email address (if you've supplied one) and possibly text you at your phone number. As for what is "unusual" is a bit nebulous, and really by design. I've received notifications when signing in to a new browser and when signing in from a location that's not usual for me (like when I was on a recent business trip to the West Coast). You will find more useful information for securing your Google Account here: How do I protect my Google/Gmail account? How can I get notified if someone tries to prevent me from accessing my Gmail or Yahoo! Mail accounts? Why does my husband's Gmail account pop up when I try to sign in to YouTube?